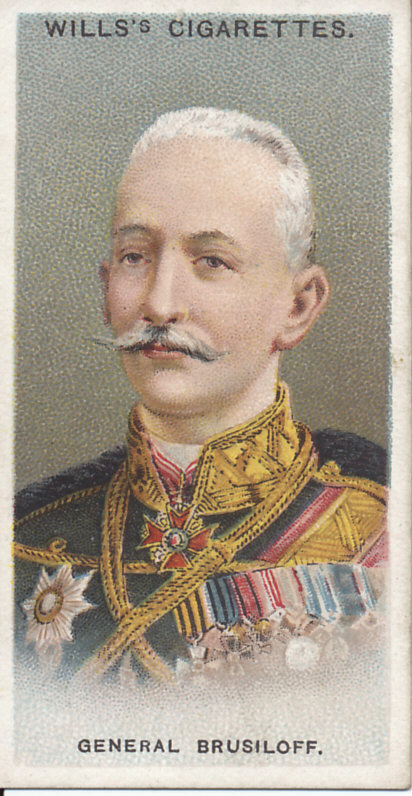 Will's Cigarettes card of General Aleksei Brusilov (Brusiloff). Passed for publication by the Press Bureau, 28.12.16. 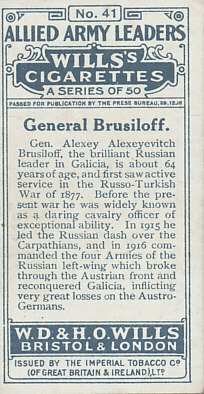 Gen. Alexey Alexeyevitch Brusiloff, the brilliant Russian leader in Galicia, is about 64 years of age, and first saw active service in the Russo-Turkish war of 1877. Before the present war he was widely known as a daring cavalry officer of exceptional ability. In 1915 he led the Russian dash over the Carpathians, and in 1916 commanded the four Armies of the Russian left-wing which broke through the Austrian front and reconquered Galicia, inflicting very great losses on the Austro-Germans. Issued by the Imperial Tobacco Co. (of Great Britain & Ireland) Ltd.
A veteran of the Russo-Turkish War of 1877, General Brusilov commanded the Russian Eighth Army in the great Russian victory over Austria-Hungary in the Battle of Gnila Lipa, outflanking the Austro-Hungarian line, and getting his cavalry behind it. In 1916, he was given command of the Southwest Army Group. His Brusilov Offensive was a Russian victory, but one at the cost of nearly 1,000,000 casualties. In 1917, Brusilov was in command of the failed Kerensky Offensive, the last Russian offensive of the war. After the Bolshevik Revolution, Brusilov fought under Leon Trotsky in the Red Army.